Data released by the Federal Reserve Board indicates that consumer credit outstanding increased over the month of October 2014. The data released by the Federal Reserve Board covers most short- and intermediate-term credit extended to individuals, excluding loans secured by real estate. According to the release, total consumer credit outstanding expanded by a seasonally adjusted annual rate of 5%. Both revolving credit, which is largely composed of credit cards, and non-revolving credit, mostly auto and student loans, grew over the month. Revolving credit increased by a seasonally adjusted annual rate of 1% ($11 billion) while non-revolving credit grew by 6%, $148 billion. Over the past year, revolving credit rose by 3% while non-revolving credit has grown by 8%. 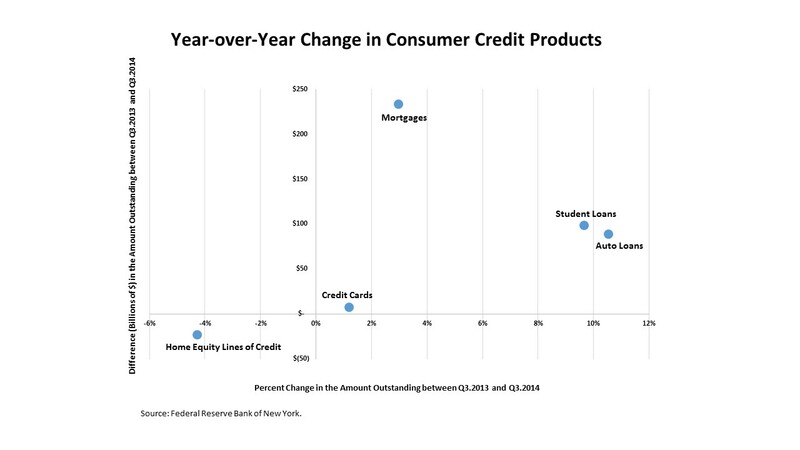 Data from the Federal Reserve Bank of New York confirms the growth in consumer credit outstanding. It also shows that the portion of consumer debt that is secured by housing also rose. However, the increase in housing secured consumer debt outstanding reflects an increase in mortgage debt outstanding, while the total amount of outstanding home equity lines of credit fell over the year. According to the figure below, auto loans recorded the largest percentage increase over the year, rising by 11% between the third quarter of 2013 and the third quarter of 2014. However, the size of the increase ranked third behind student loans and mortgages. Meanwhile, student loans recorded both the second largest year-over-year growth rate, 10%, and the second highest growth level, $99 billion. Credit cards, a component of revolving credit outstanding, recorded the smallest rate of positive growth, 1% and $8 billion. By virtue of its size, mortgage debt outstanding recorded the largest increase, growing by $234 billion over the year. However, this translates into annual growth rate of 3%. Although home equity lines of credit recorded a larger percentage drop, 4%, relative to mortgages its total decline, $23 billion, was much smaller than the increase in mortgage debt. ‹ What Homes Do Millennials Buy?